There are many things that you don’t notice until parenthood. Shock absorption on a stroller, how heavy car seats actually are, or how loud the garbage truck can be when you’ve finally put your child to sleep. Before becoming a mother myself, I thought I was busy. I was in university and had a part time serving job at my family restaurant. Thursday to Saturday played out like a crescendo. And of course Sunday, the day of rest and recovery. I remember anticipating Friday. Where are we going? Who’s going to be there? What am I going to wear? The important stuff. Fast forward ten years and I am a mother of two. I rarely know what day it is. Sleep is a rarity and absolutely amazing when I am able to secure four straight hours. We are usually up before the sun rises. There have been many mornings where I have thought, I used to sleep at this time. How times have changed. I became a mother three years ago while living abroad, and it was here that I started to notice those ‘parenthood’ things. Quality children’s wear was on every corner. Clothing was modern, simple, durable, functional. All you could want for your ever-moving, ever-messing little ones. When something is made well, it also washes well. Something I didn’t give too much thought to in my early 20’s. When we finally decided to bring our little family back to Hamilton, I searched for that same sensibility. I wanted to provide my children with products that were durable, sustainable and of the highest quality. Unfortunately, these products are really hard to come by without Amazon Prime and 5-7 shipping days. This brings me back to my post-parenthood realizations. Certain things are unimportant until they become personal necessities. Shocks on a stroller for a smooth and helmet-free ride. An empty car seat that doesn’t require body builder status to lift. A reliable white-noise sound machine to block out outer happenings. And for myself, a children’s store that offers Canadian made clothing and accessories that can stand the test of babyhood. Poop explosions. A crawling infant. Peas, pasta, prunes. All of which can destroy an outfit in a day- unless it is made well (and you have a good pre-soak regimen, of course). So, after a few glasses of wine, immense encouragement from my family, and a passion for those ‘finer things in life’, I am happy to announce the birth of my newest child. 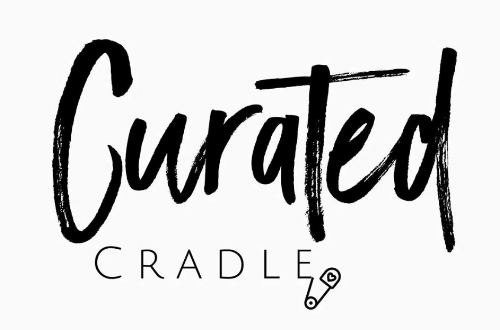 Curated Cradle, the new kid in town, will offer a wide range of Canadian made, sustainable children’s clothing and accessories, as well as nursery accents, and gifting for birthdays, baby showers and holidays. By hand selecting each product, Curated Cradle ensures that all items will stand the test of babyhood, including diaper mishaps, torn knees and pasta stains. I’ve also made some room for bath and body products for mom as well, because quite honestly, when was the last time we went shopping for ourselves. I am really excited to join the Kindertown community. Though not an expert, I hope some of my personal insights, tips and recommendations with the wide world of kids can be helpful, hilarious and relatable. For the most part, I’ll really just be sharing an honest, unfiltered perspective on being a mom! In the meantime, I encourage you to come visit me at the shop, or check out our website at Curated Cradle, on Facebook and Instagram!